permanent equine applications—with unmatched versatility! 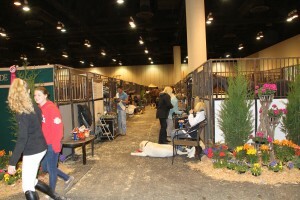 Perfect for Traveling: temporary stalls, walkways, wash stalls and trailers. Roll out/Roll up for easy install/removal. Textured Surface provides traction and reduces slippage on wet or slick surfaces. Soft, resilient material, reduces leg, knee, and hoof fatigue. Eliminates scuffed hocks and hoof abrasions. Excellent for permanent applications: stalls, wash stalls, and barn walkways. Only two pieces per stall. Covers stall surface wall to wall. Porous construction allows moisture to flow through, keeping bedding dry and reducing ammonia smell, for a cleaner, healthier environment. All matting is made to order. To request more information or a quote for your Equine project, fill out our contact form or give us a call at 800.783.2358.